Rope access has become a recognised and cost effective method of accessing areas where, previously, expensive equipment had to be utilised. Not all buildings have rope access anchor points suitable for this purpose. Barton has the expertise to design, fabricate and install such rope access anchors. They may be individual eyebolts or bespoke rope access rails and anchors. The challenge Barton experienced with the prestigious offices at Belgard Square in Dublin was to design a stainless steel rope access rail system that gave safe access to the full perimeter while remaining aesthetically pleasing. Abseilers can now safely access all elevations. The Barton’s design team worked closely with architects to ensure the rope access system met their requirements and the relevant design and testing standards (BS 8437:2005 and BS 7985:2002) while integrating seamlessly with the building structure. 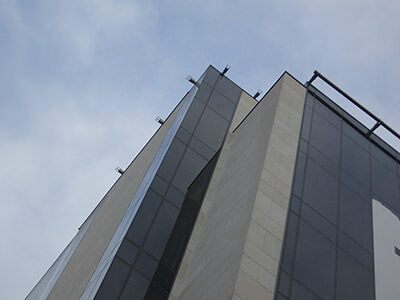 Barton’s installation team use rope access techniques to test, service and maintain rope access rails and anchor systems on many prestigious developments in Ireland and the United Kingdom.